Shirdi Sai Baba is a god of all, Baba is a saint, sadhguru, yogi, fakir. Shri Sai Baba was born in the year 1835 to a Brahmin couple his parents handed over him to the fakir when he was 5year old. These were the words revealed by baba in his last days. But Date of birth is still unknown to the world. When baba entered for the first time in Shirdi he was 16 years old approximately, People wondered looking at him a boy at a very tender age doing deep meditation sitting in asana under a Neem tree, without food and even water for several days. This made to grew lots of curiosity on young baba. Mahalsapati, the village chief and a priest, once possessed by lord khandoba, uttered that there is a holy spirit here and he named him as SAI (may also refer to the Sanskrit term "Sakshat Eshwar" ). The writer Govindrao Raghunath Dabholkar-Hemadpant has mentioned Sai Baba as incarnation of Lord krishna in Shri Sai Satcharitra (A devotional book of saibaba's life), few other devotees considered sai baba as Lord Dattatreya. One of his well known epigrams, "Sabka Malik Ek " ("One God governs all"). He always uttered "Allah Malik"("God is King"). Baba always said loving every living being without any discrimination, forgiveness, helping others, charity, inner peace, respecting our guru's reading of sacred books of our own religion, and lead his life in shirdi. One of his favourite teachings was the omnipresence of God - "Why do you fear when I am always here. He has no beginning and no end." Sai Baba's followers and devotees claimed that baba performed many miracles, such as the sacred vibhuti (ash) which was distributed to all who visited to see him has cured illness, amputating his body parts and joining them, levitation, mind-reading, materialization, entering a state of Samadhi at will, lighting lamps with water, curing the incurably sick, and preventing a mosque from falling down on people. He also asked visitors for money, which he would distribute to others later in the day to improve the karma of his disciples. It was only after 1910 when his fame began to spread in Mumbai. Numerous people started visiting him, because they regarded him as a saint with the power of performing miracles. Shirdi is a holy city where the great saint Shri Sachidanand sadguru sainath maharaj also called as Shri SaiBaba lived. It's a pilgrimage center, millions of sai devotees from all over the world visit shirdi to pay their respects to Sai Baba and take his blessings. In fact, you can travel from any corner of India by any means of transport to reach Sainagar Shirdi. We have many flights connecting from different parts of the world to shirdi. Shirdi International airport in Kopargaon, Kakadi, Maharashtra which is 16 km ( roughly 30 mins) to shirdi. Below is the approximate distance from surrounding cities. Indian Railways has trains to connect us from one pilgrimage to other. We can travel from Puri in East to Shirdi In West, Delhi in North to Shirdi, Tamil Nadu in south to shirdi back in just over 24 hours via train. 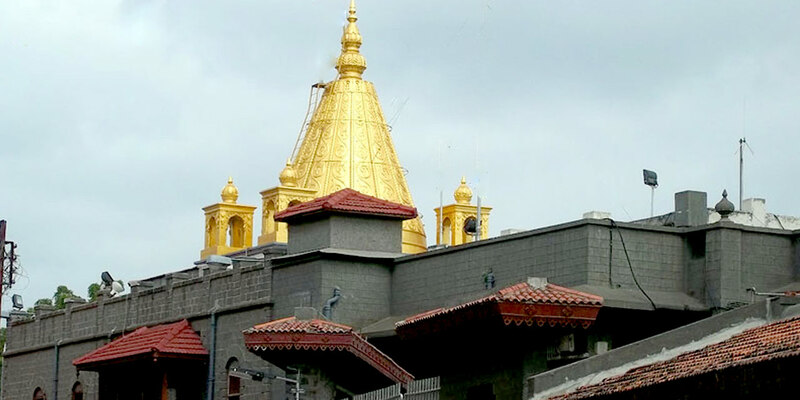 The temple town of Shirdi has recently been linked by train to other parts of India. Sainagar (SNSI) is the closest railway station, which is just 10 km away from Sai Temple. If you are not able to get tickets for Sainagar, your second best is Kopargaon (KPG) 14 km away, Manmad (MMR) 55 km away Nasik Road (NK) 85 km away and Nagarsul these are other railway stations that you can get down and reach Shirdi. Most of the cities like Mumbai, Pune, Manmad, Kopargaon and Nasik are well connected by road, you can easily get a bus, or a taxi to reach Sainagar shirdi. If you are not time-bound and want to experience the local life, Maharashtra State Transport buses run on time (mostly) and offer good connectivity from one point to another. October to March is the best time to visit Shirdi. The temple gets really crowded during summer vacations, festivals especially on Ramnavmi, Gurupurnima and Vijayadashmi. A large number of devotees also visit on Thursdays, which is - considered Sai Baba's day, procession ( Palaki seva) of Sai Baba is taken on every Thursday at 9:15 p.m.
Shri Shirdi SaiBaba temple that stands at the center of Shirdi was constructed in 1922, four years after Sai Baba's death on 15th october 1918. The temple complex is made up of a number different areas, with different entry gates. The shrine was initially owned by one Shrimant Gopalrao, a millionaire from Nagpur, who was a devotee of Sai Baba. Today it is owned and run by the Shri Saibaba Sansthan Trust. You get abundant inner peace just by gazing at this idol, where the mortal (SaiBaba) was buried inside the yard which is known as Samadhi Mandir or Baba Ki Samadhi. Baba named the mosque as Dwarakamai which is situated right at the entrance of shirdi. As soon as we enter there is a dhuni (sacred fire) burning continuously from the time when baba lit and the Vibhudhi from this dhuni was offered to all his devotees. There is another room in this level where you can view his grand Palaki( which is taken out for Palaki seva on every thursday). Chavdi means "village meeting place", but Shirdi Sai Baba used the spot to take some rest after his long hours of meditation and humanitarian trips. As a remembrance of those old days, even today Sai Baba's sacred padukas are placed inside and taken out on procession every thursday from here. The house of Laxmibai Shinde. There you can find those 9 silver coins given by Baba to her, those coins are preserved by her family and a small temple has been built for her just in front of her house. The Gurusthan holds a very special place in the life of Sai Baba. He arrived to Shirdi as a child ascetic and would sit under a Neem tree to meditate. The Neem tree still stands tall and today there is even a small temple at this place. Millions of devotees come here to pay their reverence to the Spiritual master. It is believed that lighting incense sticks ( Agarbathi) here, helps people heal from their sickness and dreaded diseases. Baba used to participate in all religious festival, had a habit of cooking and the same was distributed among all devotees as "Prasad" at the time of their visit. Today also the sansthan provides the sumptuous meal in the dining hall- Prasadalaya, prasadam which is offered to baba is also distributed among all devotees immediately after morning aarti. Khandoba is a temple of lord Shiva. Where Baba wanted to stay in Shirdi but the priest of the temple Mahalsapati who called him as Sai did not let him stay since his attire was like a muslim eventually baba stayed at the mosque which is Dwarakamai. Dixit Wada Museum, where baba belongings are displayed, is situated within the Shri Sai Baba Sansthan Trust complex and comprises of a rich collection of artefacts and photographs of Sai Baba. A small hall to the left of the museum is open for all to do Parayanam of Shirdi Sai Satcharitra. Temples of Ganesha, Hanuman, Shiva, Shani, Lendi Baug where Baba used to go for his peregrinations is also located just outside the Samadhi Mandir. This has been maintained very well by the sansthan Trust. All these places are marked with blackboards where their significance is written in English, Hindi and Marathi for devotees to know about Baba's life. We see people come for Baba's Darshan from all walks of life, so we need to have patience to stand in the queue and wait for our turn. The time taken in general for free darshan is from 4-5 hours depending on the timings and crowd. Devotees who are falling short of time or have elderly people with them who cannot stand in long queues can opt for super fast darshan and aarti. You can go online at https://online.sai.org.in/ register and book your tickets. You can also get these tickets at the VIP entry gate number one. 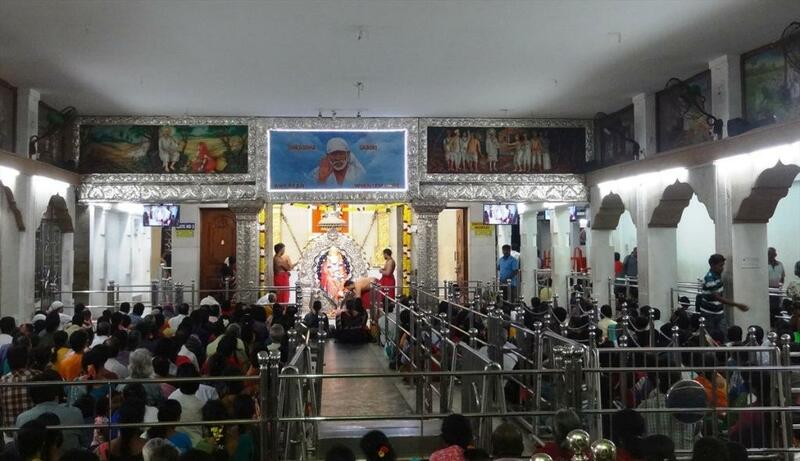 The temple opens @ 4 AM early morning first aarthi is Bhupali Aarti @4:15 AM, Devotees are allowed for Kakad Aarti@ 4:30 AM into samadhi Mandir, followed by Baba's Mangala Snanam seva @ 5:05 AM regular aarthi then Darshan begins @ 5:40AM, except during the Half an hour aarti in the afternoon Madhyan Aarti@ 12:00 PM, in the evening Dhup Aarti @ 7:00 PM and in the night Shej Aarti @ 10:30 PM. Once the last aarti is performed the temple closes @ 11.15 PM. Abhishek Pooja's, Satyanarayana Vratha pooja's are also performed every day. It's all about where do you stay while in shirdi. There are many hotels in shirdi of different price ranging from economical to luxury star hotels, few Dharamshalas too ,where one can stay at a minimal cost. Shri Sai Baba Sansthan Trust also provides room to stay for devotees. Shri Sainivas mega Residency ( Previously Mega Dharmashala) This is one of the Hotel in shirdi near sai baba temple, servicing by Shri Shirdi Sai Baba Sansthan Trust of Dilsukhnagar, Hyderabad. Shrisainivas in shirdi is well established with 156 rooms providing all latest facilities which are uniquely designed for the devotees to stay comfortably while in shirdi. The hotel has Special Room Non AC, Deluxe room Non AC, Deluxe AC rooms, Suite, Deluxe Suite, Executive Suite AC and Master Suite AC to suit the tastes and requirements of the people and is walking distance of 2 km from the temple. The ambience at Shri Sainivas Shirdi is sure that devotees can make their stay a memorable one. Shri Sainivas provide hassle free services like Hot water, Purified Drinking Water, Non smoking/Non Alcoholic Zone, Television facility, Air conditioning rooms ,Housekeeping unit, Reservation Counter - To book your travel tickets online, Free Wifi, Fire protection safety walls, Minutes walk to National Highway, Medical and General stores, Pooja Samagri store, 24x7 Security force available, Fire safety measures and Emergency exits, Helping Hotel staff ,Wheel chair facility is also available for senior citizens or physically challenged all these facilities can be availed by the devotees in shri sainivas. How to book Hotel rooms online? One can reserve your accommodation at Shrisainivas https://www.shrisainivas.com prior to your arrival in shirdi. Advance booking is always prefered while travelling with family, kids or elderly people. There are pickpockets in the temple premises, so be careful with your belongings. Keep an eye on your kids and keep them close, there are chances of them getting lost in all the melee. Mobile phones, cameras or any other electronic gadgets are not permitted in the shrine. You can deposit them at the counter and collect them later. Gate no 2 is the entry gate for all except the ones who are there for VIP darshan.